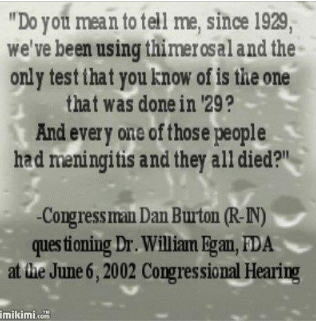 Thimerosal was tested only once, by Eli Lilly on 22 adult patients suffering from meningitis. There was no chance for follow-up to observe long-term effects, as all of the patients in this "study" died. Even if follow-up had been possible, damage to the developing brains of very young children would have remained an unknown. Eli Lilly said it was safe and the medical community accepted it. After the creation of the FDA, its use was simply continued. The federal government has never tested the type of mercury in vaccines for toxicity. This is an unconscionable oversight failure at best, at worse it is an example that we have left consensus reality to be created by the liars, thieves, cheats, killers, and the junk scientists they employ. We are living in a time where an incredible overplay and lies and self-aggrandizing behavior and non-science is the norm. We have tolerated the junk science that has covered up the true cause of this epidemic at a considerable cost to science, the public, and our very way of life in this country. Is it stretch to realize that by putting our collective heads in the sand about the autism epidemic we have made it possible for the destruction of our very civilization? LES INCOMPETANTS: OPEN LETTER TO THE AAP By K. Paul Stoller, M.D.